Pukaki Airport owes its existence to the vision of aviator Sir Harry Wigley. A former RNZAF pilot who served in the Pacific; Harry Wigley, the son of Rudolph Wigley pioneered motor vehicle access to the hermitage at Mt Cook airport. He flew light aircraft in the NZ Mackenzie basin using them for fishing and hunting trips in the solitude and sunshine. Fittingly, the new Pukaki Airport development bears his name and his aircraft types for its streets. In the early 1950’s he experimented with fitting retractable skis to his Auster aircraft, and carried out the first snow landing on 22 September 1955. 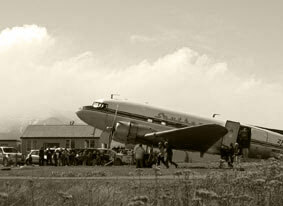 Further flights were made the same day carrying a number of passengers including Sir Edmund Hillary. 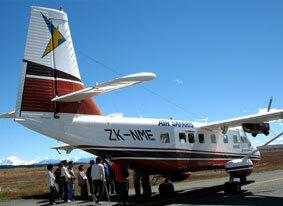 This aircraft is now on display at the Sir Edmund Hillary Centre at Mt Cook. Sir Harry, later knighted for his efforts, foresaw the need for a commercial air link to Mackenzie and Mt Cook. He obtained a license to run a scheduled service from Christchurch to Mt Cook and Queenstown using a DC3 he purchased from the National airways Corporation (NAC). Many light airfields existed but none for the DC3, or they had obstructions. He realised an alternate airstrip was needed in the Mackenzie Basin in addition to the airstrip he had constructed at Mt Cook. This was a grass strip near Glencairn Station on the South side of the Ohau River (the Ohau C power canal is understood to pass through this strip’s position now). Later a new strip was laid out on Ben Ohau Station; this strip now forms the basis of Pukaki Airport development. Legend has it that Sir Harry arrived at the site with runholder Jack Cameron, and having ascertained a desirable location and direction, put a stake in the ground and then drove in his Chev Bel Air for one mile and put another stake in at that point. Initially a grass strip, the runway was later sealed and some basic facilities established. Mount Cook Airlines had exclusive use of the site and this aspect brought the Mackenzie District Council into the picture in the late 1980’s. Mount Cook Airlines then allowed other aircraft to land and take off at Pukaki, provided they had obtained permission. It also allowed the Upper Waitaki Aero Club to establish on a section of the site during the Upper Waitaki power development years. 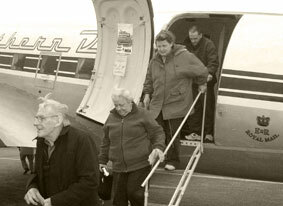 When changes to aviation tourism started in the late 1980’s the Twizel Community Board pressured the District Council to see if they could open up the airfield to other users. A report was commissioned from a Captain Smith (Smith Report) which concluded that if there was to be a public airfield it should be at Pukaki. This did not sway the airline, but one action changed everything – Lands and Survey offered up the land under the runway for sale. Mt Cook Airlines jibbed at the price, but the Council swiftly stepped in and negotiated the purchase, much to the distress of Mt Cook Airlines. It demanded the Council on-sell the strip, but the Council held its ground and awaited the airline’s lease to run its course. 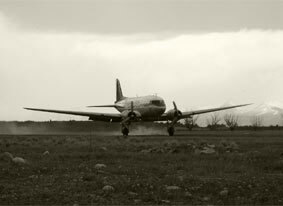 The DC3s had long departed the scene, replaced by Hawker Siddley 748s, and the Upper Waitaki Aero Club decamped to Omarama taking their hanger with them. In the 1990s, an application to fly helicopters from Ferintosh on the Mt Cook road put pressure on the Council to have a look at aviation in the Mackenzie Basin. An alternative airfield to the Mt Cook strip had resulted in a new runway at Glentanner being developed by a competitor to Mt Cook Airlines, but other airstrips were still in private or company hands. Unauthorised helicopter landings were taking place throughout the Mackenzie, prompting the Council to develop an Aviation Strategy for the Mackenzie Basin. The strategy focused on Pukaki Airfield becoming an ‘open’ public airfield, and identified a number of ‘sub level’ helicopter sites. The next chapter started when tenure review enabled Ben Ohau Station to offer the land around the Pukaki Airfield for sale. For the Council, it was the opportunity to put its strategy into action, for owning an airstrip was one thing, but without any land for hangers and facilities, it would have been impossible to turn an airstrip into an airport. By this stage, Mt Cook Airlines had been brought back into Air New Zealand and this company was no longer interested in the site. In 2003 the Council concluded the purchase of 220 hectares of land, and established a company (Mackenzie Holdings Ltd) to develop the airfield. The purchase had cost the Council $480,000.